Like with the other early Ch'an masters, details about Daoxin's life are questionable and contradictory in different sources. Daoxin is first mentioned in the Further Biographies of Eminent Monks (645) (Hsü kao-seng chuan) (Traditional Chinese: 續高僧傳; pinyin: Xu gao-seng zhuan) by Tao-hsuan (died 667). Another source dating to about 712, the Ch'üan fa pao chi (Annals of the Transmission of the Dharma-treasure) (Traditional Chinese: 伝法宝紀; pinyin: Yún fǎbǎo jì) commissioned by P'u-chi (651-739), offers more information about Daoxin's life. Later biographies of Daoxin are the early thirteenth century Wudeng Huiyuan (Compendium of Five Lamps) (Traditional Chinese: 五燈會元; pinyin: Wǔ dēnghuì yuán), compiled by the monk Dachuan Lingyin Puji (1179-1253) and the Denkōroku (Japanese: 伝光録, Record of the Transmission of the Light) kōan collection written in 1300 by Keizan Jokin Zenji (1268-1325), the Great Patriarch of Japanese Sōtō Zen Buddhism. Daoxin was born at or near present Huai-ning, Anhui Province, north of the Yellow River His surname was Si-ma. His life spanned the Sui and early Tang dynasties, which promoted religious freedom unlike the preceding Northern Zhou dynasty. He began studying Buddhism at age seven. Though his first teacher was himself morally bankrupt, Daoxin maintained his own Buddhist morality and integrity. Daoxin: I ask for the Master's compassion. Please instruct me on how to achieve release. At these words, Daoxin was enlightened. He attended to and studied under Sengcan for nine years. "Dharma has been transmitted from Patriarch [Bodhi]dharma to me. I am going to the South and will leave you [here] to spread and protect [the Dharma]." (from the Ch’üan fa pao chi). For ten years Daoxin studied with Zhikai (Traditional Chinese: 智凱; pinyin: Zhì kǎi; Wade–Giles: Shih-k'ai) at the Great Woods Monastery on the renowned Mount Lu (Hermitage Mountain). 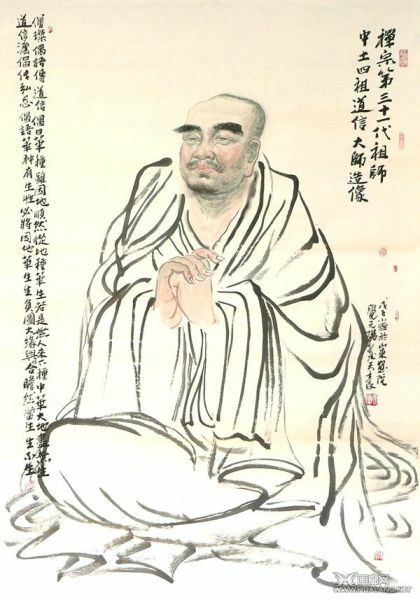 Zhikai was a master of the Tiantai and Sanlun Buddhist schools and he chanted the Buddha's name as part of his practice. Daoxin's practice was accordingly influenced by these schools. Daoxin was ordained as a monk in 607. A story tells that in 617, Daoxin and some of his followers journeyed to the town of Luling (modern day Ji'an City in Jiangxi Province), which was besieged by bandits. According to the story, Daoxin taught the local people the Mahaprajnaparamita Sutra (Perfection of Wisdom), which caused the bandits to lift their investment of the town. Daoxin eventually established residence at the East Mountain Temple on Shuanfeng ("Twin Peaks") where he taught Ch'an Buddhism for thirty years. He attracted large numbers of followers, some sources say up to five hundred monks and laypeople. According to Keizan, Daoxin returned to Qi province in 624, where he met his future successor, Hongren, who became the Fifth Patriarch of Ch'an Buddhism. In 643, the Tang emperor Tai Zong, who championed Buddhism and was a supporter of the Shaolin Temple and the 13 Shaolin cudgel monks, invited Daoxin to the capital city of Chang'an but Daoxin declined to accept. Thrice imperial emissaries came and thrice Daoxin refused them. The third time Emperor Tai Zong instructed that his emissaries either return with Daoxin or his head. When the emissary reported this decree to Daoxin, Daoxin stretched out his neck for the emissary to cut off his head. The imperial representative was so shocked he reported the event to Emperor Tai Zong, who honored Daoxin as a consummate Buddhist monk. In August 651, Daoxin bade his followers to build his stūpa (a dome-shaped Buddhist shrine) as he was nearing death. The Hsü kao-seng chuan records that when asked by his students to name a successor, Daoxin said, "I have made many deputations during my life." Daoxin further stated, "All things are liberated. You should keep mindful of this and teach it in the future." He passed away, sitting peacefully. Keizan called him "an extraordinary man, the kind we meet once in a thousand years." Also, Keizan related that after achieving Enlightenment and succeeding to the Tao, or Way, Daoxin focused his mind without sleeping and never lay down for the remaining 67 years of his life. Following his death, Emperor Gaozong, who succeeded Emperor Tai Zong, honored Daoxin with the honorific of Dayi (大邑; "Great Healer") for his skill as a practitioner of traditional medicine and healing arts. Daoxin practiced Buddhism more avidly than any dhyāna master since Bodhidharma. He developed new techniques to help novices enter intensive meditation. The following quote of his teaching illustrates his promotion of dhyāna (meditation). "Sit earnestly in meditation! The sitting in meditation is basic to all else. By the time you have done this for three to five years, you will be able to ward off, starvation with a bit of meal. Close the door and sit! Do not read the sutras and speak to no man! If you will so exercise yourself and persist in it for a long time, the fruit will be sweet like the meat which a monkey takes from the nutshell. But such people are very rare." Early in the 21st century, a manuscript was found in the Buddhist Mogao Caves near the Chinese city of Dunhuang, a former frontier garrison on the edge of the Gobi Desert and a stop on the Silk Road. The manuscript allegedly contains a sermon by Daoxin titled "Abandoning the Body." "The method of abandoning the body consists first in meditating on Emptiness, whereby the [conscious] mind is emptied. Let the mind together with its world be quieted down to a perfect state of tranquility; let thought be cast in the mystery of quietude, so that the mind is kept from wandering from one thing to another. When the mind is tranquilized in its deepest abode, its entanglements are cut asunder. The mind in its absolute purity is like the Void itself." The Laṅkāvatāra Sūtra (sacred text), which holds the actual words of Buddha, was already prominent in Zen circles. Daoxin added a stress on the Prajana Paramita scriptures, especially the Heart and Diamond Sutras. The practice and understanding of these sutras are considered to be essential parts of the path towards Buddhahood. A debate about sudden versus gradual enlightenment developed during Daoxin's time. It continued for generations and led to the emergence of new schools of Buddhism. First: The ground of the mind is essentially one with the Buddha. Second: The movement of the mind brings forth the treasure of the Dharma. The mind moves yet is ever quiet; it becomes turbid and yet remains such as it is. Third: The mind is awake and never ceasing; the awakened mind is always present; the Dharma of awakened mind is without specific form. Fourth: The body is always empty and quiet; both within and without, it is one and the same; the body is located in the Dharma world, yet is unfettered. Fifth: Maintaining unity without going astray — dwelling at once in movement and rest, one can see the Buddha nature clearly and enter the gate of samadhi. The teachings of Daoxin and his successor Hongren are called the East Mountain Teachings, a forerunner to the spread of Ch'an throughout China about seventy-five years later at the onset of the eighth century. Daoxin was the first Ch'an master to settle in one spot for an extended period unlike Bodhidharma and the earlier patriarchs who lived wandering lives. Daoxin developed a stable community life that promoted the spread of monastic Ch'an communities across China. Due to the size of Daoxin's community and its isolation from cities and towns, alms begging done by individual monks was not sufficient. The monks following Daoxin needed to cultivate fields and form administrative skills as well as take part in meditation practice. The practice of Ch'an was no longer confined to the meditation temple but the spirit of practice had to be carried into daily duties. The extension of religious practice to all aspects of daily life became a central theme in Ch'an teachings. The Buddhist and martial arts traditions of the Shaolin Temple are carried on, though, in martial arts classes for men, women, and children offered by the Michigan Shaolin Wugong Temple.